Vegetable Glycerin (VG) can be found in most pharmacies. There’s a good chance you can find it in your local supermarket or big box store. Oftentimes products are being sold for external use only and have added ingredients. Always make sure that the product you are buying is 100% food grade vegetable glycerin and is intended for human consumption. Food Grade Vegetable Glycerin can be purchased online but, as always, make sure you are purchasing food-grade product if you are using it as an ingredient in a food, beverage, or other product intended for consumption. Vegetable glycerin, also called vegetable glycerol, is a viscous, colorless, odorless syrup-like liquid derived from vegetable oils (mainly soybean oil, palm oil or coconut oil). It is obtained from a process called hydrolysis where vegetable oils are subjected to elevated temperatures over 200°C (400°F), pressure and water. The combined force of these three factors breaks down the ester bonds in the triglyceride component of vegetable oils, freeing glycerin from the fatty acid backbone. The glycerin is then absorbed by water and isolated through distillation. The final product has a texture similar to that of a syrup with the chemical formula C3H5(OH)3. Chemically speaking, glycerin belongs to the alcohol group but is classified by the Food and Drug Administration (FDA) as a carbohydrate because it is neither a fat nor protein yet provides calories (4.3 kcal/g). 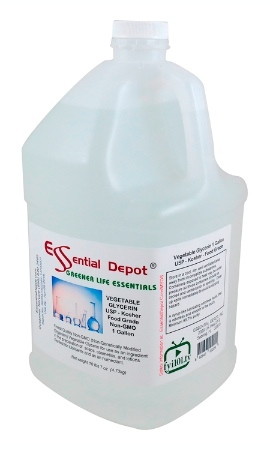 Food-grade vegetable glycerin has a purity of 99.7% (the remaining 0.3% is water). Vegetable glycerin has a number of applications in the food industry and can be added to foods as a thickener, sweetener, stabilizer or preservative. It is regarded to be generally safe by the FDA and is used mostly in sweets and processed foods. Due to its sweet taste, vegetable glycerin is sometimes used as a sweetener in place of sugar or sucrose, especially in foods labelled as sugar-free or low-sugar. It is not metabolized in the body like regular sugar and has a low glycemic index, thus does not cause a dramatic increase in blood sugar level. Another advantage is that it does not promote cavities unlike its sugar counterpart. Another property that makes vegetable glycerol an important additive in processed foods is its ability to control moisture levels and stabilize them when a food product contains a mix of oil and water. A wide range of foods may have vegetable glycerin listed in the ingredients. Items such as processed fruits and vegetables (particularly canned or precooked) and processed dairy products may contain this and other additives. Be the first to comment on "Vegetable Glycerin"